At the famous Indian Head Tournament in 1955, the Notre Dame Hounds and Brandon Cloverleafs tied for the title at the Indian Head Tournament. 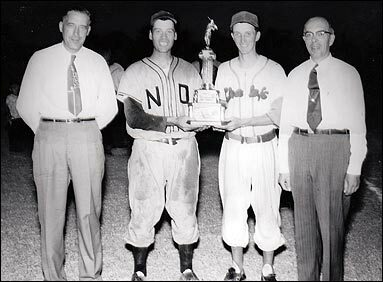 That's Frank Germann of the Hounds, second from the left, sharing the trophy in the photo at the right and just to the left of the Brandon representative in the photo below. The two teams survived a fast 16-team field to reach the finals then fought to a 4-4 draw before 3,000 fans. 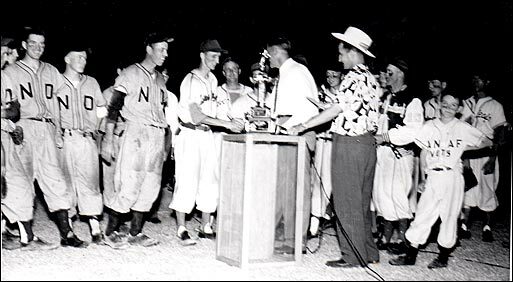 The game was called after nine innings because of darkness and the clubs shared top honours and an equal share of the $4,500 prize money.